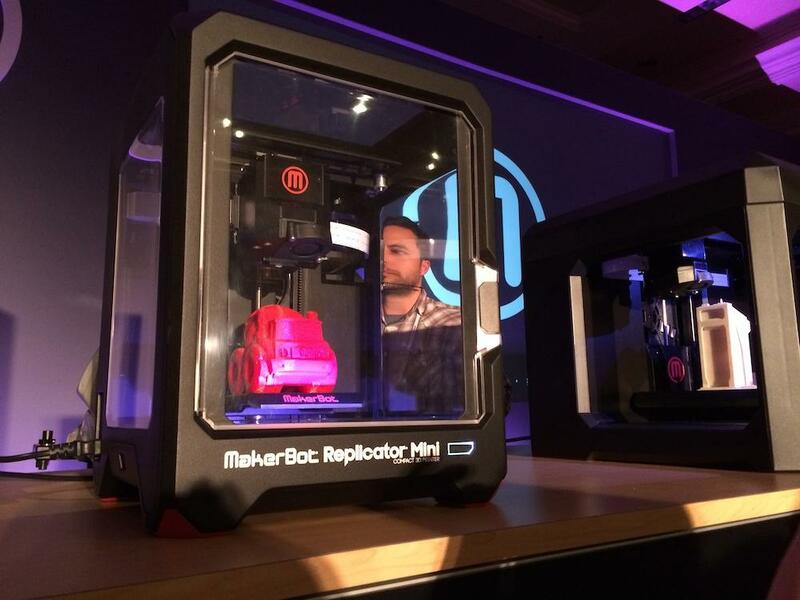 MakerBot further solidified its place as the leader in consumer 3D printing during its big CES 2014 press conference on Monday afternoon in Las Vegas with the debut of three new Replicator 3D printers, apps, and more. “We innovate so that others can innovate,” said Bre Prettis, co-founder and CEO of MakerBot, which has been showing off its additive printing technology at CES for the past five years. This year, however, the company appears to have earned its place in the spotlight. 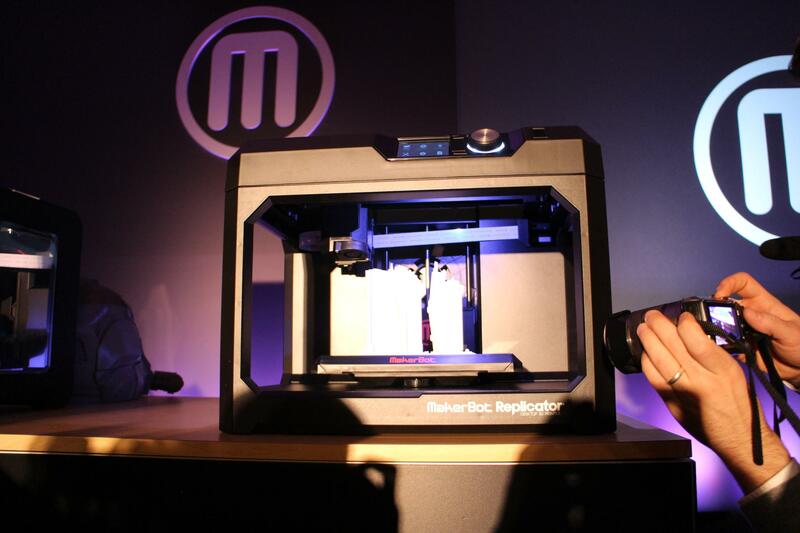 Here are all the big new offerings from MakerBot in 2014. In developing the Mini to be the smallest, most simple-to-use printer on the market, MakerBot redesigned the extruder head and made what it calls the “Smart Extruder.” Unlike earlier extruders, this one connects/disconnects via magnets, and – since Mini is also Wi-Fi enabled – will send you an alert to your MakerBot smartphone or desktop app (see below) when you’re running low on PLA filament. 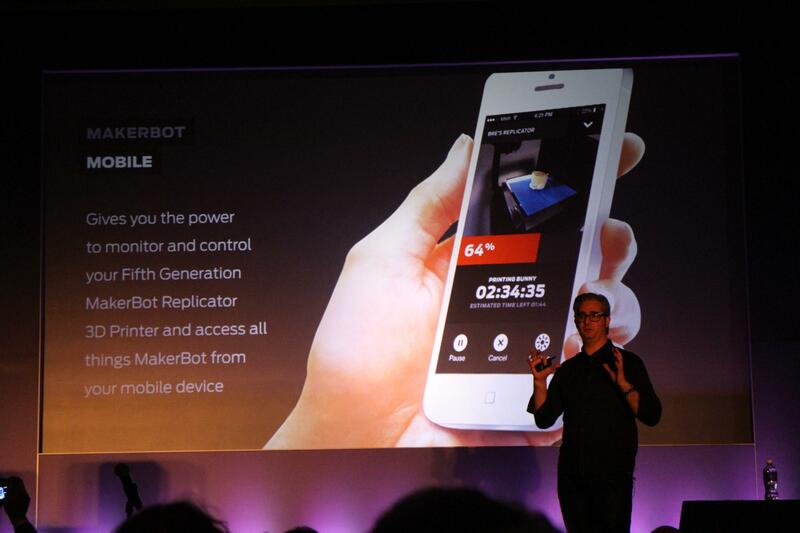 MakerBot Mini will sell for $1,375 when it starts shipping in spring of this year. 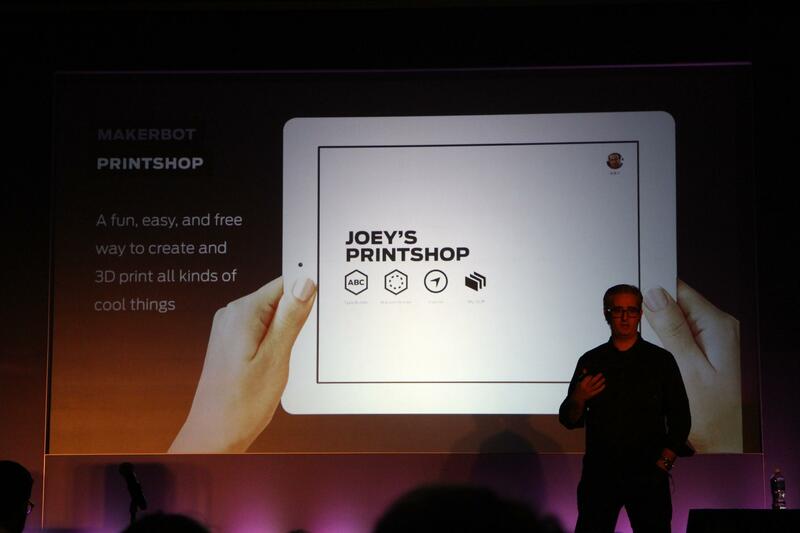 The second new printer unveiled during the presentation was the new and improved MakerBot Replicator. 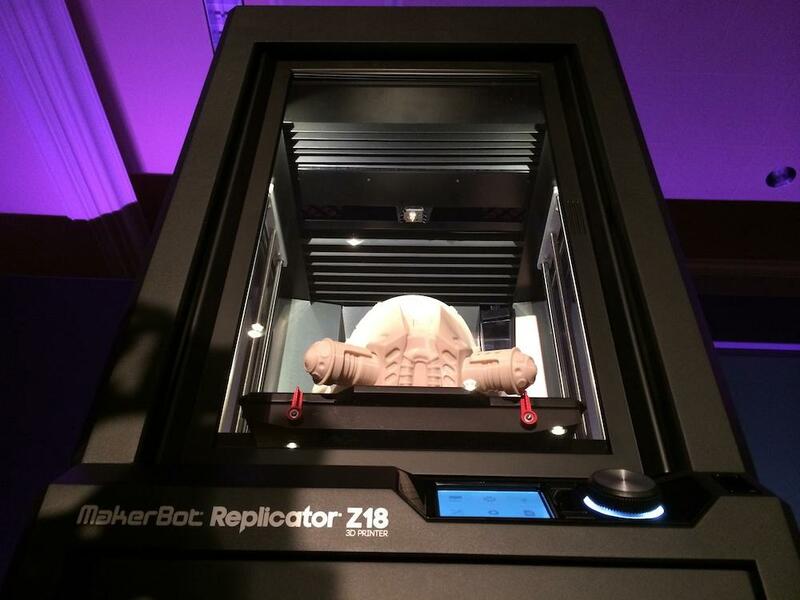 It prints the same size and dimensions as the Replicator 2, but packs more powerful, more intuitive features. First and foremost, the new replicator is equipped with the same Smart Extruder and Wi-Fi connectivity as the mini, meaning it’s super simple to work with and maintain. Second of all, this one sports a 3.5-inch LCD display and a selector wheel that vastly improves usability. You can literally just scroll around until you land on the function you want. New Replicator is available today for $2,899. It starts shipping in a couple weeks. In addition to the pint-sized Mini and the new-and-improved standard sized Replicator, Pettis also pulled the curtain back on the Z18 – MakerBot’s hulking behemoth designed for industrial applications. This one can print things up to 12x12x18 inches. As with the previous two models, the z18 also comes equipped with a Smart Extruder, LCD control panel, and Wi-Fi connectivity, so that it can easily interface with MakerBot’s swath of new apps. This big, bad box will start shipping in the spring of 2014, and will go for a cool $6,499. The MakerBot desktop app is more than just MakerWare with a new finish. In addition to the MakerWare functionality (which, as Replicator users know, parses 3D models into a printable format), the MakerBot desktop app also includes full access to the Thingiverse archives of more than 218,000 3D designs, allowing you to easily download pre-made 3D models. Another welcome feature is the MakerBot Cloud Library. As the name suggest, this allows you to store your 3D models in the cloud, so you can access them from any computer anywhere in the world. Finally, the desktop app gives you direct access to your MakerBot 3D printer, delivering useful information, like how long your projects have been printing, and how much time is left in the process. On top of the desktop app is a mobile app that allows you to receive alerts when your Replicator runs out of printing filament, and when your project is done printing. Both the desktop and mobile versions are free. The mobile app will be available for iOS devices in spring 2014, while the Android version will launch sometime later this year. For MakerBot users who are looking for fun 3D-printed projects that are relatively easy to design, MakerBot has created the Printshop, which includes a number of new features. The Type Maker, for example, lets you type in anything and then print it out in 3D. (Pettis used movie quotes as an example, but we can imagine a variety of hilarious uses for this feature.) Next up is the Bracelet Maker – which, of course, makes 3D printing custom bracelets a breeze, according to Pettis. Last in the MakerBot lineup is Digital Store, an online shop where you can buy pre-designed 3D models. So far, it seems as though this is mostly geared toward the kids in your life, with a variety of different 3D-printed “action figures” – townsfolk, dump trucks, airplanes, spaceships, animals, etc – that you can download and print with your new Replicator, Replicator Mini, or Replicator 2 3D printer. Digital Store figures start at $0.99 for individual pieces, and $9.99 for a full set. Customers can start downloading plans for those now from here. Drew Prindle contributed to this report.